Whining. I don’t think there is much that grates on the nerves of parents more than whining. There are many possible paths you can take to curbing whining. You can ignore the child when they whine. You can require the statement be made again in a non-whiney way. You can set the timer and let them try again when it goes off, similar to ideas outlined in The Timer. 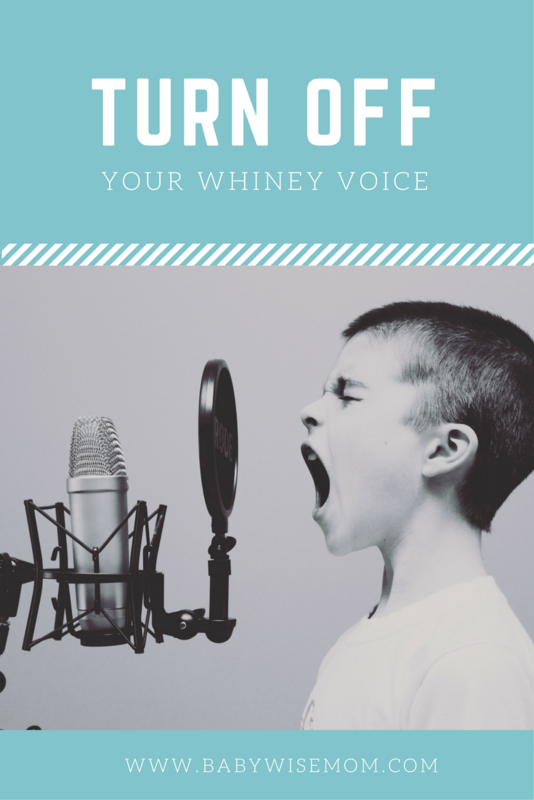 You can tell your child over and over again to not whine. You can respond to the whining by whining yourself. Any one of these can work. Most likely, a combination will be required. But I have found something that is the best for Kaitlyn. All of those other thing seemed to work fine for Brayden, but for Kaitlyn, it just wasn’t cutting it. A couple of weeks ago, I found my new favorite discipline phrase. Instantly, the whining is gone. Instantly. It is like magic. Good magic. You know, in all honesty, it seems strange to me that this works best for her. In theory, the ignoring until they are done whining sounds like a good one. But let’s be real. This typically just creates more whining, which then escalates into full on crying. At some point, you are going to respond and your whole tactic just created a bigger problem. I think ignoring can work fine for older kids who know better, but not our little toddlers are still in the heat of training. Restating things in a non-whiney way can be effective. It works on teaching correct habits. But if it is the only thing you ever do, then your child doesn’t learn to never whine. I love the timer. It has worked wonders in so many aspects of our lives. But again, I think this is something that will be more effective for the older children. I can see it being good for the older toddler. But it has potential really cause things to escalate with your young toddler. I think looking at your whining 20 month old in they eye and saying, “Kaitlyn, don’t whine” is great. Do it calmly and matter-of-factly. It helps the child recognize when she is whining. Another activity that teaches what whining is to whine yourself. For the toddler, I think it would be best to demonstrate whining in times of non-conflict. This means you show her while she is happy and not whining. Don’t try to teach her as she is whining. For the preschooler, whining back can be a tension breaker and cause you both to bust out laughing. Then you can talk like civilized people. That’s always nice. Like I said, a combination of these tactics is usually best. Change as your child grows. Currently, “turn off your whiney voice” is doing wonders for Kaitlyn. With all the others, she would talk in a normal voice for a sentence or two and then go back to whining. With our new phrase, she stops and is non-whiney for days. Really. I think the phrasing of it shows her she has control over it. She can still talk to me about what she wants to talk about, she just needs to turn that whiney voice off first. We will certainly be trying this. My almost 2 year old seems to have his whiney voice stuck on ever since he got sick a month ago. We've tried everything I can think of, and like you said, a lot of the tactics just don't work well on our him because of his age. We've got nothing to lose regardless 🙂 Thanks for the idea! Wonderful! I am going to try this at our house. My husband and I just had a "parent pow-wow" about what we were going to do about OUR McKenna's whining! She's 20 months and has a very limited vocabulary. I read this post at a perfect time. We're going to take a deep breath and give it a try! Thanks! I second Penny's request! I LOVE the Terrific Toddlers books! They have been a huge blessing for our family! Penny, yes! That is on my list of things to read but I am having a hard time rounding the books up. I only have a 12 months old baby at home, but I'm already thinking about how to stop the whining from accelerating… She doesn't really have any vocab. and the tactics you suggest are maybe more appropriate for older toddlers. I really, really don't want my girl to sit and whine for things at the dinner table for example. Is there anything I should think about at this age to make things easier later on? Thanks for your wonderful blog! Yes, I am exactly where Rebecca is. I'd love to hear what tips you have for curbing the whining habit (especially at mealtime) before it gets bad. My son knows how to sign "more" and we've been trying to teach him "hungry" and "all done," but he just prefers to whine. We are trying a few different approaches, but none really seem to be working right now. Rebecca and LWSOP,I would suggest you use sign language to get her to ask for things appropriately. See the blog label "sign language" for more on this.But also know that I think pretty much all kids give whining a try at some point. The trick is to not let it become the most effective form of communication for the child of getting what the child wants.